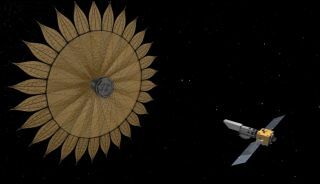 An artist's depiction of a sunflower-shaped starshade that could help space telescopes find and characterize alien planets. Harness works with Tiffany Glassman and Steve Warwick, of the aerospace company Northrop Grumman, to test starshades on Earth in dry lake beds and on mountaintops. Harness presented some of the test results at the Emerging Researchers in Exoplanet Science (ERES) Symposium at Pennsylvania State University in April. A zeppelin was originally proposed to hoist the starshade into the air, but it proved unreliable. Earth-like alien planets are up to 10 billion times fainter than the stars they orbit, making it a challenge to study them. "When you point your telescope at a star, you're just overwhelmed by starlight," Harness said in his presentation. A starshade, also known as an external occulter, would counteract this effect by blocking the light from a star, similar to the way placing your hand over the sun can help you see other objects in the sky. Starshades could be a variety of sizes; a typical one might be 100 feet (30 meters) wide and would fly tens of thousands of miles from its partner telescope. And the starshade wouldn't be a perfect circle. Instead, it would have flower-petal-like protrusions that would create a softer edge, resulting in less bending of light (and thus a darker shadow). Starshades could be used with any space telescope, from the James Webb Space Telescopeto a future instrument, advocates say. Diagram of a starshade lofted by a rocket. A guiding telescope will direct the rocket while a science telescope studies the sky behind it. "We want to get rid of that scare factor everyone thinks of when they think of a 30-meter (100 feet) disk in space," Harness said. The basic concept of the tests involves a small telescope on the ground, with a starshade suspended a short distance away. Initially, the team started with the idea of suspending the disk from a zeppelin. However, it turned out that the airship was difficult to control with the necessary precision. "It turns out, you can't hold a giant balloon to centimeter accuracy," Harness said. Before the problems could be worked out, the company that manufactured the zeppelins went out of business. Making starshades hover in the sky isn't the only way to test the technology. "The next-best option is to get rid of these pesky vehicles and their stability, and just mount a starshade on a mountain," Harness said. The team has run several starshade tests on dry lake beds in the desert, placing a starshade 1.2 miles (2 kilometers) from the telescope. No astronomy was performed in the desert tests. Instead, an extremely bright light source served as the "star," while a far dimmer LED light functioned as the "planet." "The whole purpose of these tests [was] to demonstrate we can get a billion times contrast," Harness said. An unwound telescope could be placed on a mountain while a telescope on the ground moved along with the Earth to study the sky behind it. As predicted, the starshade successfully blocked the "stellar" light, allowing the team to observe the "planet." These results were published onlinein 2013 in Proceedings of the SPIE (Society of Photographic Instrumentation Engineers). Using a ground-mounted starshade to do astronomy required a slightly different approach. The team took the roughly circular starshade and "unwound" it, creating a picket fence on top of a hill. As Earth rotated, the background stars moved against the starshade fence, which was angled to follow the path they would take across the sky. As Earth moves, the observing telescope must also move to continue studying the same star. The team took an image of the star they wanted to observe and then moved the telescope down the road, where they waited for the star to line up behind the next petal. Studying the stars with the starshade on the ground proved difficult. Conditions constantly changed as light refracted through Earth's atmosphere. To compensate, the telescope was placed on a motorized stage that allowed researchers to position the starshade in the star's line of sight. The distances between the starshade and the observing telescope have been increased gradually. The goal is to successfully test the technology at a distance of 1.8 miles (3 km). At that distance, with the smaller Earth-bound starshade, the team should be able to resolve the debris disk around the star Fomalhaut, Harness said. Such resolution would be comparable to that required for studying an exoplanet, and Harness is confident the team will succeed. "We think that starshades are the only near-term solution for characterizing and determining the habitability of an Earth-like planet," he said.